Our goal is to provide our customers with the best service we can. Our mission requires a commitment to safety, dependable quality service and customer care from our employees. Our friendly drivers and loaders are a familiar sign in the neighborhoods we serve. We strive to provide dependable service for all our customers. We work hard to keep the high quality of service for our residential and commercial customers alike. We provide weekly trash service for $25.00 per month for household service which includes 5 black bags or 10 of the white “kitchen” size bags. We do have rates for larger bag counts if needed. We require all trash be bagged for the ease of handling and your convenience. Please keep the weight reasonable ( 50lbs or less) It is necessary to bag loose trash… #1 to keep from receiving fines for loose trash… # 2 to avoid workman’s comp claims for back injuries from lifting heavy containers… #3 trash left in your containers attracts animals . We cannot accept hazardous materials, tires or batteries. We dump at Eco Vista landfill at Tontitown. We have 2 and 3 yard dumpsters ..we deliver to your location and you can load them at your own pace and they will be dumped once a week by our packer trucks. 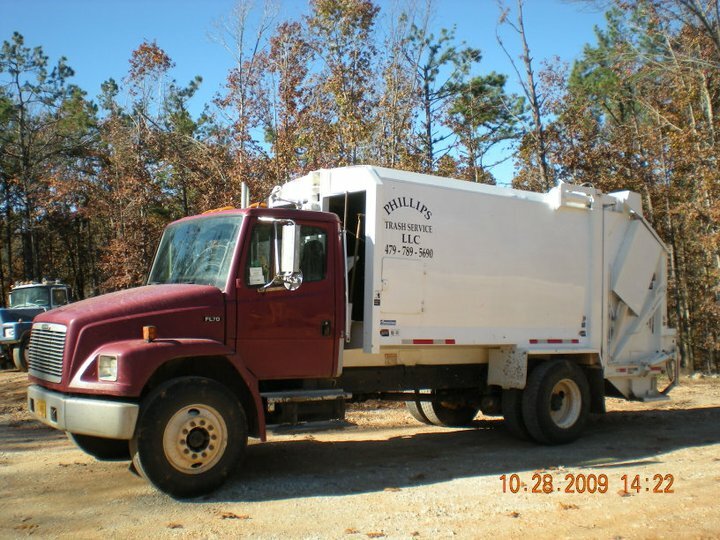 The prices are $90.00 a month dumped once a week(4 dumps per month) for 2 yard and $120.00 a month also dumped once a week(4 dumps per month) for 3 yard. We do not charge a delivery or pick up fee for these ~Because We appreciate your business !! We can also help you with disposal of large items like Televisions, Hot Water Heaters, Furniture and Appliances. We can also take refrigerators and freezers if the compresses have been removed or freon has been drained! The standard trash pick-up workday is between 8am and 4pm but please remember, while trash pick-up routes over time tend to follow the same schedule, there are times when a day could change. A new crew or someone covering for a vacation or due to bad weather they might run a route differently, besides trash trucks break down causing delays while another truck is dispatched to finish the route.